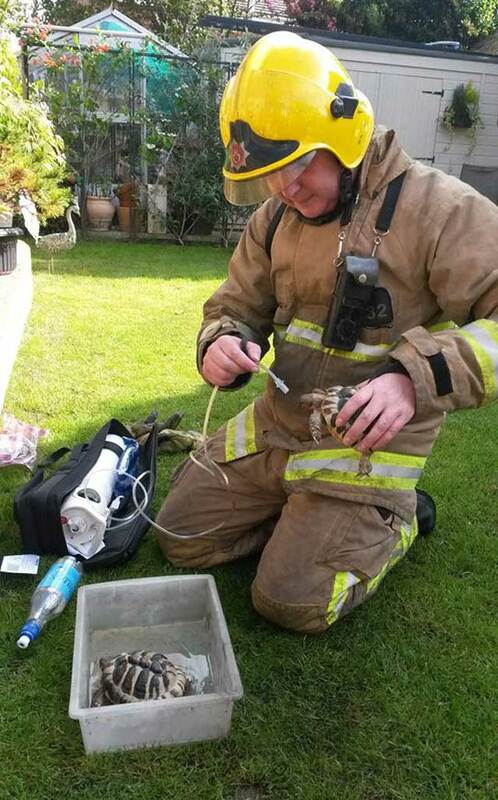 Two pet tortoises were rescued after a fire broke out at their owner's home on Thursay morning. The fire is thought to have been caused when a lamp being used to heat a tank containing the tortoises set fire to a piece of wood. Hampshire Fire and Rescue Service sent two appliances to the property in Fair Oak on the outskirts of Eastleigh. The tortoises were rescued from the property and given oxygen to aid their recovery. A fire service spokesman said the house was smoke-logged as a result of the fire but damage was confined to the tank. Well done those guys, I'm glad they care about reptile pets too. I admit however I'd just have put them in the box, closed the lid with the oxygen tube and made them an impromptu oxygen tent. I'm led to believe some American fire services actually carry first aid books for pets.